HPCrazy wrote: The park just released this test-run P.O.V. Check it out! I agree the time on the lift is a bit long, plus, as RCoaster pointed out, look at the water dummy on the lower left corner of the video. The ride has a total of 4 airtime elements (ARG). To me, that's no different than MF. A GREAT ride no doubt. VERY re-rideable too. I personally was just hoping for more. I expect another "running of the bulls" to happen with this one. WOW, thanks for posting this video! Wonder what was going through their minds during this run lol. It definitely will be fun ! I think the first drop/turn look great, but almost identical to MF, and agree, just like MF, the ride fades over time. 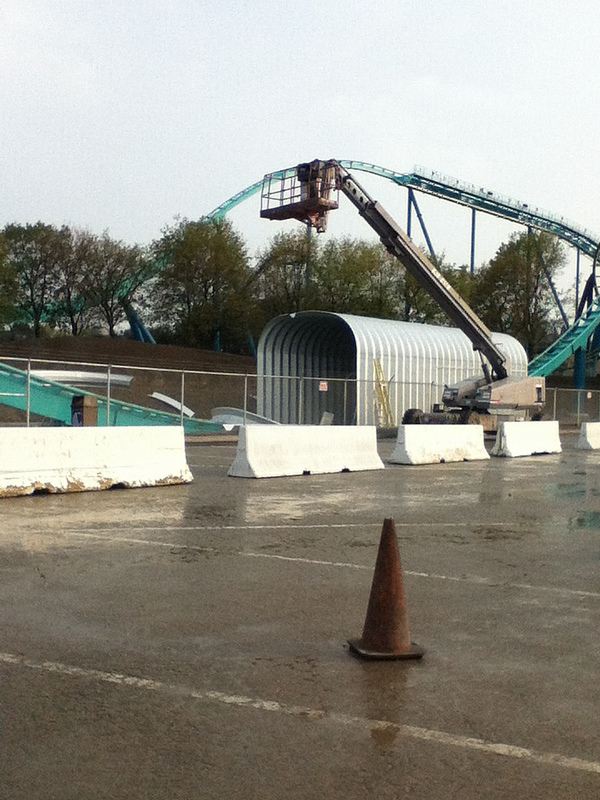 Screamscape reported today that the trench at the bottom of the first drop will in fact be a 100 foot tunnel - SWEET ! Sounds awesome! 100 ft tho? You won't even see it! I think the point of the tunnel is more visual as a head chopper. Goliath and Bizarro have very short tunnels, while this one actually looks long enough to add some theming or special effects if that wanted. Park News - (4/24/12) The bidding war over the first ride seats on Levithan ended earlier today. From what I’m told the highest bid was $1000 for a seat, and totaled up the auction raised over $63,000. The trains are very well themed and look great. Congrats to CW for raising so much money for a worthy cause. I can understand the strong interest in riding and can't wait to hear some ride reviews. Levi entrance looks absolutely AWESOME! Leviathan's media day was this week and ride reviews are starting to come it. Many compare it to MF and will wait until I ride it personally to chime in. I did find this news report of the ride, which includes 3 GREAT videos. When you play the video, you first get the news story - but - after it ends you get the entire reverse POV of the ride - and then - an entire POV. I will say two (2) of the riders are women with long hair, and let you be the judge during the reverse POV on the airtime. That will be a nice added touch to the ride. I hope they add some themeing in the tunnel, and agree it does add a good head chopper effect regardless. Screamscape shared this funny video of a news report and worth sharing here as well if you missed it.